Finally a stove customizable according to the environment in which it is inserted. Designed as a piece of furniture and not only as a heating device, DOMINO characterizes modern and contemporary spaces in a new and surprising way, leaving to the user’s creativity the choice of materials, accessories and the place where to position the stove. CHOOSE THE COLOUR: two colours available for the coating; black and white. CHOOSE THE SUPPORT: 3 different materials and aesthetic for the support leg: tulip round, quadripod in natural wood or painted steel of the same color as the front. 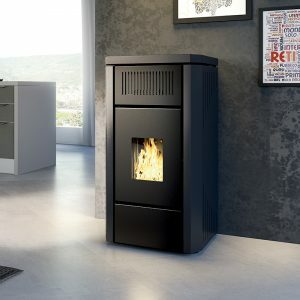 The perfect cylindrical shape, the preciousness of the materials used (top and base in cast iron of great thickness, all black glass that “opens” the view of the fire only when the stove is burning) make of Tonda the totemic shape par excellence, for an object which characterizes in a decisive manner the image of the room. Essential and modern design that takes inspiration from the skilful fold of a single sheet of steel. The use of cast iron for the top and the base and the large door in black serigraphed glass, make Less a piece of furniture with great personality even when not in use. Stove of balanced proportions and with a wide chromatic choice. 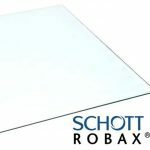 Coating in “mat” painted steel foil and ceramic glass resistant to high temperatures. 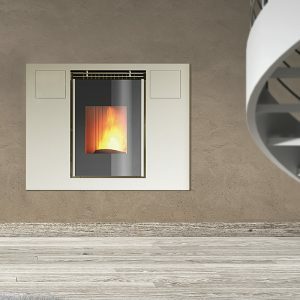 With Vertigo Horus offers its customers a ventilated air stove extremely simple to use and maintain, thanks to the easy accessibility of the hearth and all its components, but highly effective in heat output. Versus is the Canalized of Horus. Shapes that respect the tradition of the stove, but bevelled finish that refines its appearance. The image is that of a quality product, thanks to the “mat” finish of the steel that covers the stove. It is equipped with an innovative dual fan system, solution that makes the stove extremely silent, having each motor to “work” at a lower RPM than the models that have only one fan. Furthermore, the double fan, allows to canalize up to 10 meters, with minimum heat loss. Object of great visual impact, where the rounded shapes contrast with the great portal in black serigraphed glass. The robustness of the image of the product is given by the high thickness of the “mat” painted steel top, as well as the rest of the structure. The double colouring hearthcoating exalts its lightness. Alma is the ideal solution for versatile installation in a variety of home environments. Finish in “mat” painted steel foil, Alma is designed to harmonize fully with the existing furnishings or simply play the role of first actress of an empty wall. 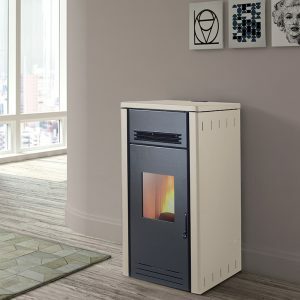 The hermetic stoves are ideal for well insulated and passive houses, because they don’t need to consume the air inside the houses. The air needed for the combustion and the cleaning of the glass, in fact, is drawn through a canalization directly addressed from outside the house. 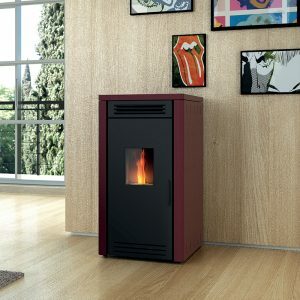 This air inflow allows a better quality of combustion and therefore more comfort. Icon is a search for shapes contemporary but functional to the furnishing of living spaces. The large glass vertical door combined with the mat painted steel of the sides achieves an essential aesthetic presence but with a strong stylistic identity. Aqua is a real heating system: circulating pump, expansion tank, safety valve, venting valve and pressure gauge are already integrated into the stove. 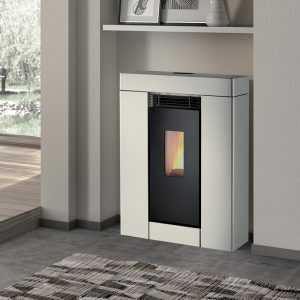 In addition, both the boiler, and the heat exchange pipes are made of AISI 304 stainless steel, a material that makes these stoves exempt from any problem for many years. The coating is made of “mat” painted steel. Globe is a real ventilated fireplace with the largest flame of the category, thanks to the innovative brazier that duplicates the size of the flame for greater scenic presence. 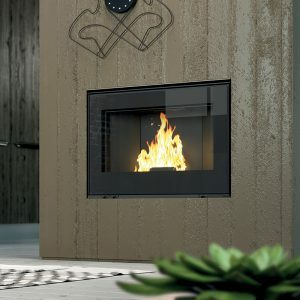 Ideal as a solution for the creation of a new fireplace, or for rooms with generous dimensions. Provided with the upper hot air outlet through 2 openings with diameter 150 mm and possibility of ducting hot air in other rooms. The finish includes black serigraphed glass. Supplied with forced ventilation with double fan. 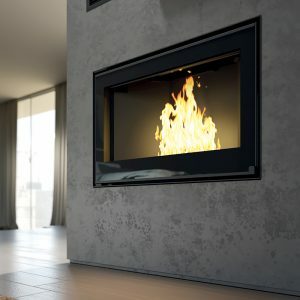 The tool to revive the old fireplace: from mere decoration the fireplace will turn into an efficient heater, programmable with the intuitive display, just like for the boilers. 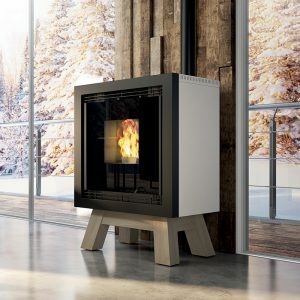 Designed to be completely removable with respect to the internal structure, BOX connects easily to the chimney already existing and can be installed without major structural changes or demanding masonry. For the extreme ease of assembly, BOX is also particularly suitable for new fireplaces. The hot air outlet is provided frontally above the glass. 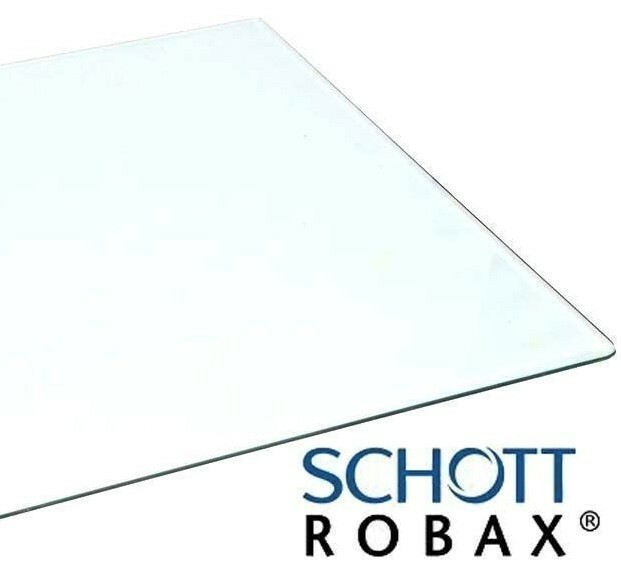 The other product features are: the finish in black serigraphed glass, the sliding of the insert on guides for loading and the infrared remote control as standard. Various optional are available for pellet loading and assembly. 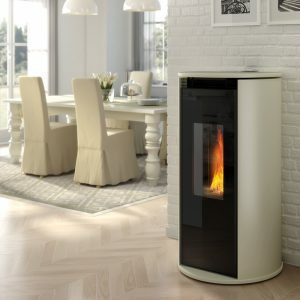 Essence is the stove-insert that canbe installed in place of an old chimneyor built into a wall and create the warm and friendly atmosphere of a real fire but with the comfort of a pellet stove. Equipped with the most practical system of pellet loading existing on the market: just press on the cover provided on the front of the unit and pour the contents of the pellet sack directly into the tank without removing the stove from the wall or making uncomfortable manoeuvres. The cleaning is done by removing Essence from the wall through the sliding guides. 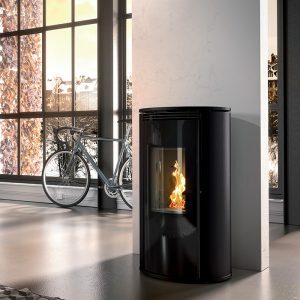 Realized in “mat” painted steel, Essence has a stylish door in black serigraphed ceramic glass that gives the stove a strong personality even when turned off. As an option you can equip Essence with an height adjustable stand for easy and safe installation. Object of great visual impact, where the rounded shapes contrast with the great portal in black serigraphed glass. The robustness of the image of the product is given by the night thickness of the "mat" painted steel top, as well as the rest of the structure.